We are asked many questions regarding terms and abbreviations used in the NSP (National Sisterhood of Presvyteres). So, we have decided to create this page to explain them. If available, links to the appropriate websites have been provided. This will be an ongoing process. If you can think of anything to add to this page, please e-mail the information to Pauline Pavlakos. Thank you. APC: Archdiocese Presbyters Council, Fr. Mark Leondis, President. Benevolent Fund: The APC-NSP Benevolent Fund was established to provide short-term support for clergy families in a time of crisis. Aid is available to celibate and married clergy. Underrstanding that confidentiality is of utmost concern, if you know of someone who could benefit from this fund, or if you need help yourself, please contact Presvytera Nicole Keares, NSP President; Presvytera Mary Christy, NSP Vice President; Fr. Mark Leondis, APC President; or Fr. Paul Kaplanis, APC Vice President. Food for Thought: A pamphlet compiled by the National Sisterhood of Presvyteres. The three intertwined hearts on the cross symbolize the active, retired, and widowed presvyteres united as sisters in Christ. Mary Stephans-Brown, daughter of Father George Stephanides of blessed memory and Presvytera Elaine Stephanides of Laguna Hills, California, designed the NSP Logo. Mary's rendering of the NSP logo was chosen by the NSP board and presented at the 2002 Clergy-Laity Congress in celebration of the 20th anniversary of the National Sisterhood of Presvyteres. Observer: Orthodox Observer, a monthly publication of the Greek Orthodox Archdiocese of America featuring news on the Orthodox Church, Archdiocese, Metropolises, profiles, and editorials. OCMC: The Orthodox Christian Mission Center is the the official international missions agency of the Standing Conference of Canonical Orthodox Bishops in America (SCOBA). Patron Saints of the NSP, who are they? Our Patron Saints are Martha and Mary and their feast day is celebrated on June 3. The Apolytikion is: Since you believed in Christ with strong and ardent faith, and ever worshipped His divine and mighty deeds, you both adorned yourselves with all the splendor of sacred virtues. 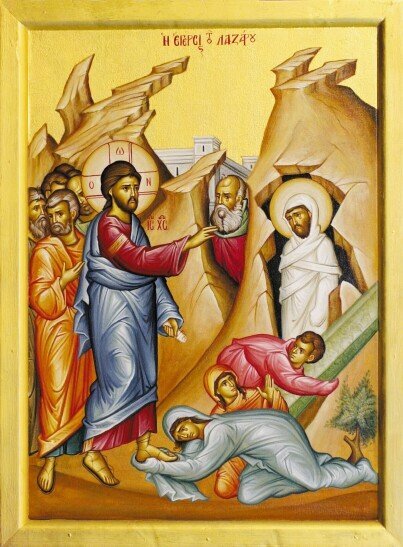 With your holy brother now, you are also granted to dwell with the ranks of saints on high, O sisters of Lazarus, and with him, O wise Mary and Martha, pray for us all unto the Master. Sister-to-Sister: An outreach program for those whose husbands have been newly ordained. The new presvytera/diaconissa is contacted at the Metropolis level via a phone call and welcomed to the NSP by her Metropolis rep. She will then receive a fun and informative package from the NSP. She will also have a "Big Sister Presvytera" contact her to bring her to the next Metropolis event or just talk. Contact Jeannie Monos for more information. Stewardship: "How much are our dues?" That question has been asked frequently. We do not have "dues." We operate by stewardship donations. The amount is determined by the individual. Please click on the following link below to submit your stewardship electronically.